Ethereum is an open-source public service that uses blockchain technology to facilitate smart contracts and cryptocurrency trading securely without a third party. Imagine you want to rent a chalet from a service that uses Ethereum. A smart contract is generated, informing you that after sending the required amount of funds, the service will then send you a digital key for your chalet. As it is carried out in the blockchain, everyone on the network can see that you sent Ethereum and likewise, that the service has sent you the key to the chalet. As everything that goes on in the network in real-time, when a transaction goes through, a copy of it is distributed through the whole network. If someone were to try and alter the details of the contract, every copy in the network would take note of it. This makes buying a service or rental through Ethereum secure. Overall, Ethereum is a programmatic platform that can be utilised to build and develop applications via its own currency. As compared to Bitcoin, Bitcoin is created as an alternative to your regular money and is a medium of payment transactions and store of value. Ethereum is started by one person, Vitalik Buterin, who is a Russian-Canadian programmer and began developing Ethereum at the age of 19. Buterin was expecting many people to point out where he was wrong when he formally announced Ethereum in a Bitcoin conference in Miami but unexpectedly a lot of people was supportive of his idea and this kickstarted the momentum of his project. A crowdsale eventually funded it in July 2014 and this was the first ever initial coin offering (ICO). Ethereum was further developed as there were many questions regarding the security and scalability. In 2016, $50 million of Ether was stolen by an anonymous hacker, which resulted eventually caused a split within Ethereum community. This split resulted in two blockchains: Ethereum and Ethereum Classic. Despite that, Ethereum currency has grown more than 13,000 percent in 2017. It is speculated that Ethereum’s aggressive growth might soon overtake Bitcoin in usage. Transparent & Open-sourced: All records are publicly available for anyone to check. Anyone can also build applications and products on top of the Ethereum blockchain. Trustable and Secure: Every program executed on the blockchain is by a signed program, and no third party or middle-man is needed. Data written on the blockchain cannot be changed or deleted by any third party. If the data is to be updated, the previous versions are still kept, with additional details of the transactions like sender and receiver approximate time) are always recorded. Detailed roadmap: There is a clear vision of where Ethereum will be heading towards in the coming years, which are being implemented with a strict rigour. This provides confidence to the community. Speed & Capacity: As Ethereum is open-sourced where anyone can build a program on top of Ethereum, each new node will continue to work longer and longer which affects the speed of the software. This will eventually slow down the transactions and prevent it from scaling. No Supply Cap: Similar to fiat currencies, every time a new coin is brought into circulation, the value of Ethereum will lower. Bubble Trouble: With many projects built on Ethereum without any proof of concept, ICO valuations are out of control and the quality of projects are going down rapidly. Thus, some of the projects that you invest in can be a scam instead. 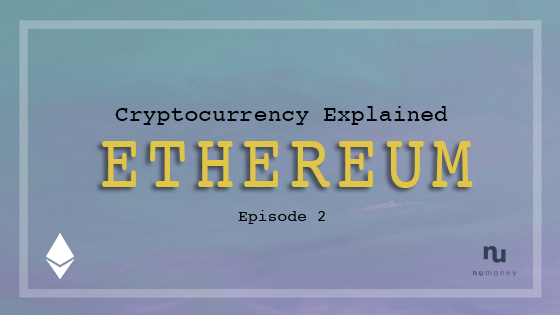 There you have it, Ethereum explained in under 5mins. As always, before deciding to invest in anything, do research more before finalising your decision.